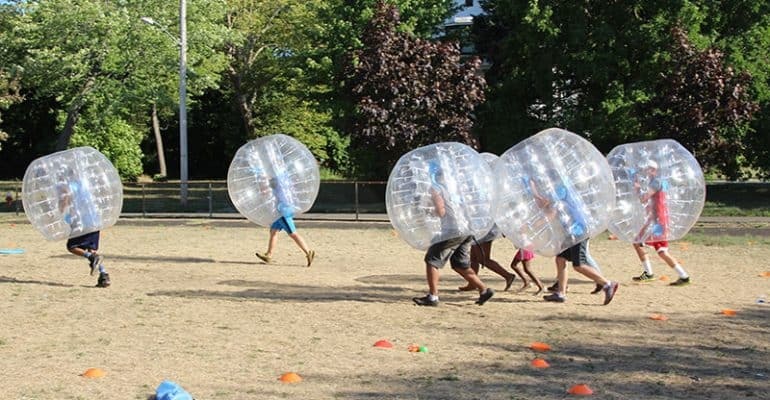 Zorbs have had a major impact on humans’ ability to damage our own dignity by giving us the opportunity to cover our bodies in what is essentially bubble-wrap and air cushions and act like ancient gladiators. Add the skills of playing a typical match of the “other football” and you have a hilarious game of Bubble Soccer. The pitch is set up like any other soccer pitch – two goals at the end and a center court where the ball is kicked off into play. We recommend a minimum 6 players with proper shoes and a giant Zorb. Two players battle for the kick to start the game. Once the ball is in play, all players come in. Goals are scored when a player is able to kick the ball into the opposing team’s net. Of course there’s no hands, but when half of you is stuck in a Zorb, your hands aren’t getting near the ball anyway. Offside doesn’t really count either. The Zorbs are enormous, making it nearly impossible to even see an offside. Since two of the most important rules of “real” soccer have been eliminated, Bubble Soccer is perfect for people who don’t know how or have never played soccer before. Proper sportsmanship is always a requirement.